Follow them AND leave a comment stating that "My Creative Time" sent you! ;) EASY PEASY! ;) You ALSO would like to do the same on my Bestie's blog as well! Great cards!!! And what an awesome giveaway!! WOHOO, I am a follower Emma, what a cute project for today that would be a great gift idea for teachers. What a great giveaway! Visited the Imaginisce blog and became a follower! Thanks for sending me over there - hadn't discovered them yet! I have been a faithful follower!!! and I love those cute cards!!! TFS On my way to your bestie and I!!! What an awesome giveaway...I am so glad I am a follower cause I love your creations! Awesome project and giveaway, Emma! I'm now a follower on Imaginisce! I have the I-Top and I love it! thanks so much for the chance to win! You are totally awesome with your cards and what great gifts you make and what a neat giveaway. Awesome cards and such a wonderful giveaway. I already follow you and Imaginisce. I check both blogs daily as you both have such wonderful projects and inspiration. I've left a comment at both. Thanks for the wonderful chance. Adorable cards. Peachy Keen stamps are at the top of my wish list. Oh my - this card set is soooooo awesome! So is the prize! Thanks for the chance to win! I'm headed to the other blogs now! So cute Emma! I hopped on over to the imaginisce blog and became a follower and left a comment. Wow this is really Cute....Great Giveaway Thank You for the chance to win..
Oh Emma, these are just adorable! Love the stamps and you have totally inspired me to look at the dollar bins at Target in a new light! And I also learned how to cut the end of the ribbons so clean! I guess my hair coloring is affecting my brain! Thanks for sharing and doing the videos! those are soooooo adorable you are amazing! Cards are great. What a fabulous give away! You ROCK! 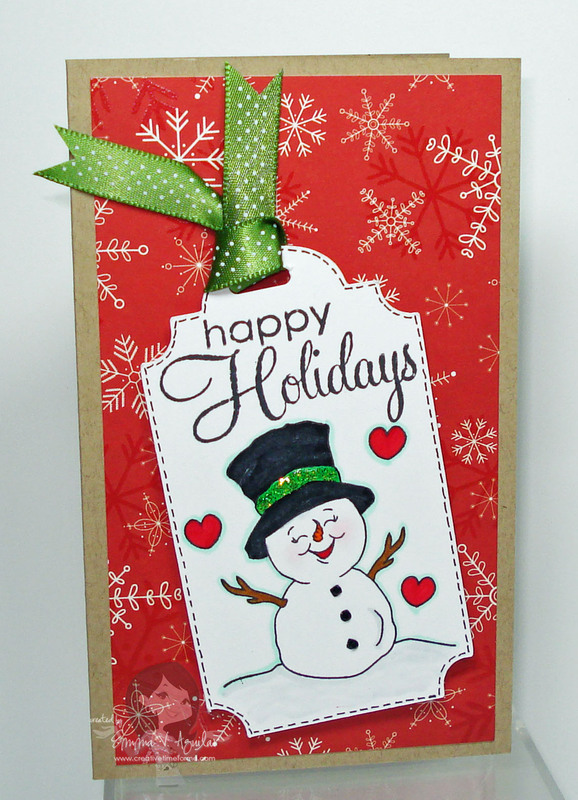 That little snowman stamp is so cute! ADORABLE. I can't wait to get my Peachy Keen order so I can have that snow cutie in my hands! :) I already follow Imaginese so I will go and leave them a comment that you sent me. Thanks for all the fun and inspiration. me(at)glorajean(dot)com. Those pillow boxes are such a great idea! TFS, can't wait til tomorrow..
You are soooooooo talented! Thanks for sharing! I am so inspired by you. great project!. I'm following you & Imaginisce. Love their cottage paper that you used on these tags. Wow Emma you always AMAZE me with your creativity. I LOVE LOVE LOVE these cute little cards. Those are soooo cute! How in the world do you come up such great ideas everyday? My brain hurts thinking about it..LOL. Seriously..those are just too adorable! What a great giveaway. Of course I am a follower. This apron would really boost ones self esteem everytime you wore it. Great give away! Love your videos, I always learn something new! I love Christmas and I love the video! Thanks for the inspiration! awesome cards! What a great giveaway! I am now a Imaginisce follower as well :] thanks! What a super cute gift set. So bright and cheery, I just love that ribbon too! Terrific as always. Great cards Emma - they are so cute! This giveaway, WOW is all that i can say!!! OMG!!! you are the greatest!!! !love this idea tooo!!! too cute! what an awesome gift giveaway!!! love it thanks for the chance again Emma YOU ROCK!! Love your card set. It is so cute! Wow, an awesome project and awesome giveaway! Would love to win! Already a follower of yours and now a follower of imaginisce as I like their stuff as well. TFS & the awesome giveaway! I love this idea. I still need to get out my christmas gifts. I plan on making everyone cards as well. Wonderful Project. I love it Emma. I am a follower of all 3 of the blogs already!! I will also leave some love on Imaginisce blog too!! OOOOOOOOOOoooooooooo, Aaaaawwwwwwwwwwww, I am love your super cute card set!!! Thanks for the chance to win such an awesome prize.. WOW!! Your cards are soo super cute!! That is an awesome giveaway!!! Thanks for all the great ideas, I cannot wait to see what else you come up with! This is so adorable. I think I might make some of those adorable gift cards. What a great idea for a gift!! I love the card its such a great idea. You also have great giveaways. See you tomorrow. Great idea for the gift set!! What an awesome giveaway Emma!! Awesome project and great giveaway!!! You did it again. What great cards. Your such a good crafter. Thanks for the great ideas and a chance to win. great giveaway, the cards are wonderful. Good gift idea. So super cute. I love these kind of projects to share with friends and family. A finishing touch would be add 4 x-mas postage stamps. Debbie H.
P.S. I loved yours and Nikki's projects on day three with the Wrap it cart so much I went out and bought it last night! Thanks so much for sharing you talent. These cards are adorable, I don't trust my coloring ability yet however. Did a shout out on the Imaginisce site! great giveaway, love your cards. I am alrady a follower and my next step is to head on over to imaginesce to follow them too. That little snowman is adorable and what a nice gift! I've already been to Nikki's and now I'm headed to IMAG. Can't wait till tomorrow. Super cute cards and awesome giveaway! I love your cards and those stamps are adorable! I will definitely be ordering some of those clear boxes as well. Oh Emma that is way too cute! What a nice little gift for teachers or for anyone for that matter, When I'm done with your ornament idea..this is next! Very cute cards and such a nice giveaway! I just got my little snowman from Peachy Keen yesterday and I love how you made your card with him on it! These are sooooo cute! I'm lovin the 12 days of Christmas. Thanks for another great project. WOHOO Emma, what a cute project for today. This so much fun and what ideas. Tfs my friend. Got to go see Nikki now. Just became a follower, Nice! Love the cards! I went to Imaginisce's blog and told them you sent me too. I've been a follower of both for awhile now! Love your stuff!! These cards are adorable! I love the packaging too. Thanks for this great giveaway and also for the wonderful inspiration! Your cards really ROCK! I am already a FB follower and lover of Imaginisce! what an awesome giveaway today! I would soooooo love to have it! Love these.. they are so cute! I am already a follower of Imaginisce. thanks for sharing and the chance to win! Awesome cards and give away!! Love Imaginice!! What cute cards and such an awesome giveaway! I went over to Imaginisce and became a follower. Great cards and a fun idea for friends. A wonderful giveaway today!!! Thanks for sharing and a chance to win. Cute, cute, cute cards!!! I want an I-rock!!! Pick me! Love the cards and what a great giveaway!!! what a terrific gift idea and they were so cute. I just love coming to your blog, you always have such great ideas and such creativity. Emma, these cards are the cutest!! I am already a follower of yours. I'll head over to Imaginisce now and leave a comment. I was thinking of making some cute cards for my girlfriends and these are adorable. Love your card sets and I actually could do this project. I grabbed your 12 day blinkie also. SUPER cute Emma what a great gift, I love the cards the whole project fit together so neat. Awesome project and giveaway Emma. Everyday the first thing I do is check yours and Nikis blogs to see what new project you have done. Thank you so much for sharing. 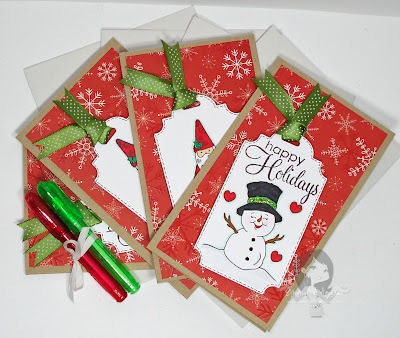 What a great idea for making cards as well as gift giving. I need to have another look at the PEACHY KEEN site and get myself some more stamps. Thanks for sharing your creative ideas. I love your cards they are sooo... cute, you rock Emma. Plus an awesome giveaway! Thanks for sharing your creativity with us. LOVE these cards--gave me some ideas for some tags I'm going to make. That snowman is precious! I'm a follower! What a thoughtful gift! I loved your inspirational story and love the cards even more. The packaging is great. Thanks for sharing and the opportunity to win. These cards are cuties!!! your coloring is wonderful and the I-Rock gems just added that much more. What an awesome giveaway! Im a follower- glad I stopped by today! I am a follower of course! I just love the card set. I will be stalking ya. thanks for sharing. I am now a follower! Looking forward to some great ideas! I am already a follower & I left some luv! I am already a follower. Very nice gift. Simply enough for me to make. I love this idea! I like the color combo and those adorable stamps. What an awesome thing you ladies are doing! What darling Christmas cards! I am definitely not a good colorer. LOL. I am following both blogs and posted that you sent me their way. I'd be so thrilled to win some Imaginese products. So hard to win though since they are sooooo popular. Everyone loves them! Thanks for the chance, Emma. Love the cards. Love the giveaway. So awesome of Imaginisce to sponsor the giveaway. Wonderful products! Your cards were so cute as usual...love the Peachy faces. Thank You for doing the 12 Days...it is so much fun. Thanks for the chances to win great prizes. 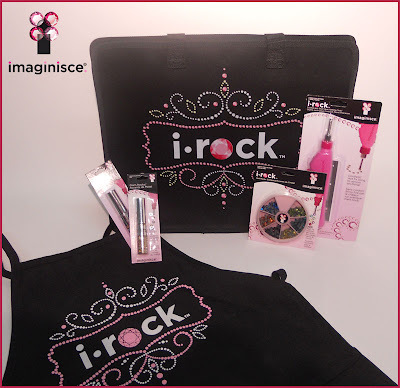 I would love to win the i-rock bag full of goodies! Awesome! WOW!! What an awesome gift!! Thank you everybody for setting that up for us. This is a great blog. I am really glad to have found it. Happy Holidays. Cute cute.. thankyou for a chance to win..
Wow, I just love it!!! You are so creative Emma!!! I absolutely loved this gift idea, really got me in the mood to craft!! Also a very awesome giveaway from Imaginisce!! Just love your card set!! I am a follower and I will hop on over to Imaginisce and get in on the fun!! Whooppee!! Sweet card set! It's a great idea for making those little extra gifts you need for teachers, neighbors, etc. Thanks for sharing. Oooh, what an awesome project! Great Job!!! I love the pks stamps!!! super adorable! Those cards are way too stinkin' cute! Great job! These are adorable and so nice to have on hand for small gifts. Thanks so much for sharing. WoW I love your card set, I need to make some too thanks for the great inspiration!! And for a chance to win such a cool prize!! i def. need to go shopping when im in LA at the end of Feb. I am now a follower and soooo glad I am! Already a follower of Imaginisce and on my way to leave them the note. I have wanted and have tried to win one of their Aprons forever! Amazing gift. I love it. Thanks for all the inspiration. That is such a pretty card set. I am inspired to get started on my holiday cards. Super cute Emma!! I love it! Thanks again for sharing! Love your little project and plan to make some for stocking stuffers! I am now a follower and also follow Imaginisce's blog too! Thanks for the 12 days of Christms tutorial! You did it once again! The card set was adorable. Thank you for sharing. WOW Emma, those are adorable. What a great idea. I love those images, you color wonderful. Great job. Awesome tags & awesome giveaway! Thanks for the chance to win! I pretty much never win...but I never give up trying!! Love the cards, what a cute idea. Another great idea. i am going to be busy next week. Emma, these are soo cute! What a great idea to give to someone! I want some copics soo badly, I'm sure it would take me a long time to color as well. I tend to be a perfectionist as well. I'm already a follower of both! Those are way too cute. I love the cards. What a great idea. Nice videos. I enjoy them. You always come up with the neatest and cutest projects! Love this set! Holy smokes I'd love to win this prize pack! WOWSER - love your project - love Imaginesce - CANNOT find that cottage collection anywhere locally so would LOVE to win it!!! Wowser, what a great prize. Thanks so much for offering! great cards Emma! What a great giveaway! Emma this is LOVELY!!!!! What a Sweet gift!, I visited Imaginisce(Already a follower) and wanted to say Thank you for the Awesome JOB you and Nikki are doing!!!! Your ideas are awesome as always!! Love your cards, Emma! Thanks for all the great ideas. Love the cards. You make it look so simple. Thanks for sharing. Another great idea Emma, You rock. I'm lost-day 4 or 5? Anyway the card set is so cute. simple and a quick gift. love it! What a great gift ideal. Love it! I also added your blinkie to my blog. Your projects get more fabulous every day Emma!! Thanks for the inspiration! That's a cute gift set ... good thought to include a pen. What great gift idea. You make everything look super duper cute. Thanks for all the inspiration. OMG, I love those cards. I would love to do something like this. always love to visit you! You are the most incredible gal I have ever seen! Where do you get all your Ideas? You are the best and Thanks for Sharing!! The tags are really cute. Love the cards. I love these sweet tag cards and I love that paper, I have it too! I already follow both you and Imaginisce. I left a comment there telling them you sent me. Thanks for this great giveaway! You do such a wonderful job, love them all!! Your projects always look really good. Thanks for sharing. Super cute set of cards! The cards are soo cute! Thanks for sharing!! I Love your cards! Want to come and do mine for me..Just can't get into the Christmas spirit..Thanks for the chance to win your awesome giveaway! Adorable cards! I look forward everyday to see what you have done. Adorable card sets Emma! TFS! Emma I am having so much fun on this 12 day tour!!! Too much fun. This is uber cute. I love these cards. I am going to make a batch of cards for my SIL, with 3 kids they always have b-day parties to attend. 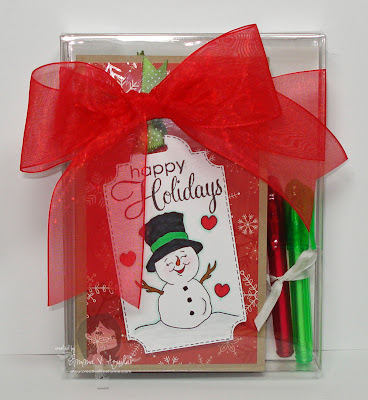 Love this...I just recieved my PK stamps with that cute snowman in it...great idea to "scraplift", Can't wait to play! What a cute, cute set!!!! I love the addition of the pens with the set, what a neat idea!!! And the giveaway today.... awesome!!!!!! Oh Emma! I love the cards and this is a great idea! Thanks for the inspiration. I'm already a follower. TFS and the chance to win. Great gift! I always wondered where everyone gets those clear boxes from. Thanks for the info! =) OMG I love those cards and how you put matching pens in the packs! I'm already a follower here and on Imaginisce. Thanks. these are super cute. You are so talented! omg... everything is getting cuter and cuter... yay! Super great ideas. you are so cute. thank you . These cards look so cute and when you box then up with the pens and bow and candy they look so pro:) Emma ROCKS:) TFS! 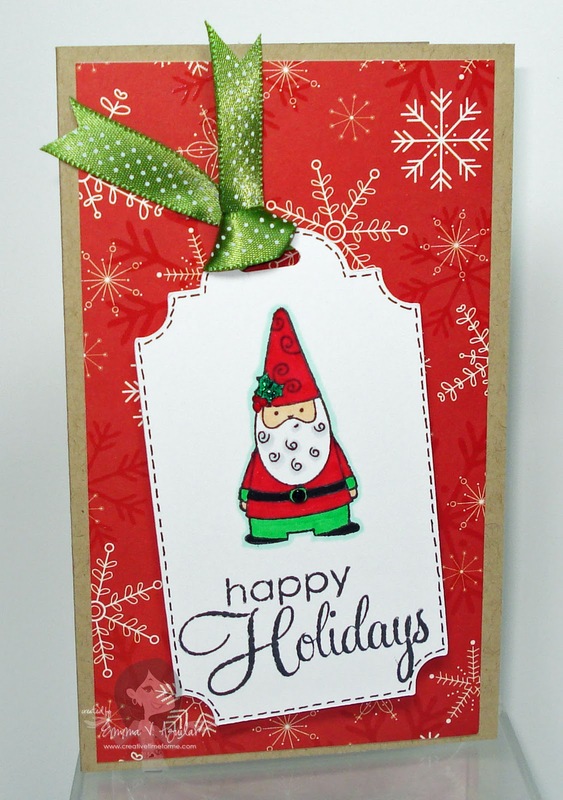 Such cute cards and I wish I would have ordered from Peachy Keen so I would have gotten that cute snowman too. Also, what a great giveaway. Love the card's very cute....I am on my way to Nikki's blog and Imaginisce and will become a follower. I have never been there before soooo I am very excited!! Thank's for the great giveaway!! These cards are too cute!! I think I am going to have to "scraplift" them. Thanks for sharing. OMG!!! Awesome!!! I'm off to Imagineisce and to cross my fingers.